This grain mill accessory is manufactured in Germany by messerschmidt for 27 years. The milling heads are made of a high carbon surgical stainless steel and are only 1" in diameter. Being so small, the leverage required to turn the rotor is very little. This does not heat up a motor or cause ware from friction. Compact Storage: The grain mill will fit on the KitchenAid with a twist of the wrist. Easy to store in your without taking up much room. The mill steel burrs grind low temperature frictionless milling, avoiding the heat created by most grain mills, giving a true grind. Heat can destroy many of the nutrient in your flour. A cup of fine flour is produced in approximately one minute with the KitchenAid Stand Mixer. Large 5 cup hopper open hopper for continues grinding of grains. Family Grain Mill ® easily and quickly remove for cleaning. The Family Grain Mill ® is dust-free. Wheat, oat, corn, (not popcorn) rye, spelt, kamut, barley, rice, peas, most beans, coffee, flax seeds, sesame seeds, most dried herbs, dried jalapenos and other hot peppers and more. 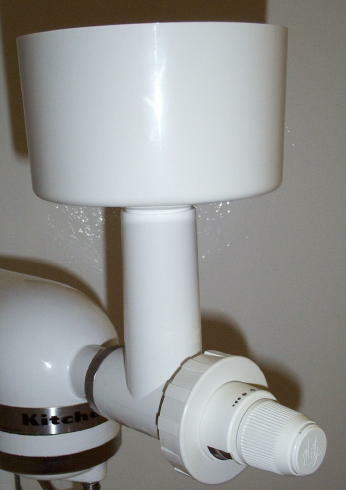 This accessory can be used with power(by attaching to your kitchenaid) or without electricity. Purchase the Family Living Grain Mill and the Kitchenaid adaptor and the hand-Turned bace.